Science fiction isn’t my favorite. I often have a hard time expanding my little brain and falling into make believe worlds of sectors, quadrants, and intergalactic planets. With that being said, I know that there are amazing books out there that in this genre, I just often just skip over them. 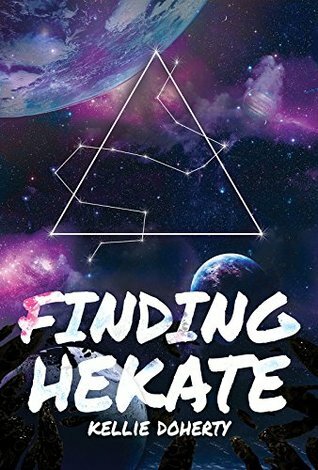 I am so glad that I did not pass on Finding Hekate by Kellie Doherty. This book is outstanding! The sci-fi book has romance, crime, drama, tragedy all rolled into one. Oh it was good! Captain Mia Foley has had nothing but tragedy in her life. Her childhood was marred as her entire family and small community were killed by an evil villain, the leader of the Acedians. This monster, Charles Donivan, boarded her family’s shuttle craft and murdered everyone, only the teenaged Mia survived. Before her escape however, Mia was tortured endlessly and branded by this maniacal man. The dark and broody Mia has had to spend the next years running from his people as they ruthlessly hunt her and kill anyone she meets. While she should be still on the move, she cannot for the life of her break free from the friendships she has developed with her new crew, especially her first mate Cassidy Gates. Cassidy is keenly intelligent. She watches Mia, and has learned a lot about the captain in the six months they have been working together. Cassidy’s easy manner and good humor has endeared her to everyone, even the somber Mia. She works to pull the true manner from the captain and changes her for the better. Cassidy hasn’t had an easy life either. Maybe they see this in one another and are bonded by the pain they both have endured. Cassidy is a ray of light in Mia’s dark existence. Their interactions are sweet and heartfelt. You can literally feel their unspoken love for one another. This book pulls you in right from the get go. I was totally engrossed in this book fairly early in Finding Hekate and I had no intention of putting it down. What makes this book so good is it is so multifaceted and smart. It has a strong romance. Mia and Cassidy’s push and pull towards each other is very well done. You really feel for Mia and the horrible way she had had to live to escape capture from the Acedians. She has had to make tough decisions to continue, she is not without remorse. The blame and guilt she feels is gut wrenching at times, but as the reader, it gives you so much insight into the character and you become her champion. I love books that make you feel and this is definitely one of them. This is a sci-fi book yes, but it is so much more too. I highly recommend this one! Reblogged on my blog ~ thanks so much for the lovely review!